8Bitdo has made a name for itself recently with its line of Bluetooth controllers themed after classic Nintendo pads. The latest, the SF30 Pro, is up for pre-order now. Wasting no time in taking full advantage of the Nintendo Switch’s Bluetooth tech, 8Bitdo has designed its latest Nintendo-inspired wireless controller with the new console in mind, adding distinct ‘Screenshot’ and ‘Home’ buttons, alongside rumble and a set of extra shoulder buttons. The company is no stranger to producing Bluetooth controllers that walk the razor’s edge of copyright infringement, meticulously recreating classic Nintendo controllers from the NES, SNES and N64 eras. Its latest creation is the SF30 Pro, which improves upon the previously-available SF30 by adding a set of fresh features including improved thumbsticks, D-input and X-input functionality, motion controls, rumble and USB-C connectivity. 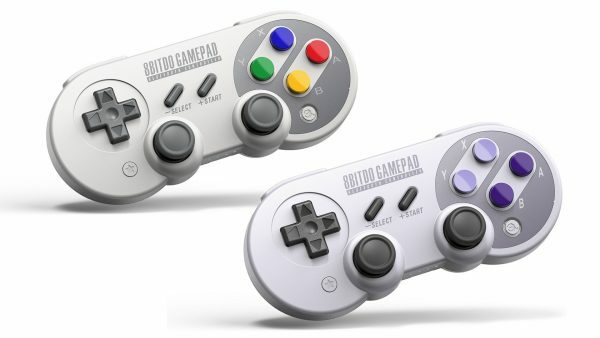 These super cool pads, which also work on PC, Mac, iOS and Android devices, are set to release on December 10th in the US and can be pre-ordered right now at Amazon for $49.99, available in US SNES or European SNES colour schemes. No sign of UK pre-orders just yet but rest assured, we’ll keep you posted when they appear.